Are we headed towards a constitutional crisis over Donald Trump’s xenophobic travel ban? It sure looks like it. A constitutional crisis in this case is, among other things, the systemic failure of institutions in the government. A battle between two or three—in this case two— of the branches of the US government that ends with a clear winner in theory but another winner in practice could provoke that failure. And the prerequisites are in place. In the two weeks since Jan. 27, when the President signed an Executive Order barring entry to the country for people from seven Muslim-majority nations, the government is pulling apart at the seams as the executive and judicial branches fight over who has the final word on the order. The administration has lost every major court battle thus far. On Thursday, the order had its greatest defeat thus far as the Ninth Circuit Court of Appeals unanimously rejected the ban in favor of the arguments against it from the states of Washington and Minnesota. In the ruling, which you can read here, the court explicitly rejected the Trump administration’s argument that the courts had no right to intervene in issues of national security. 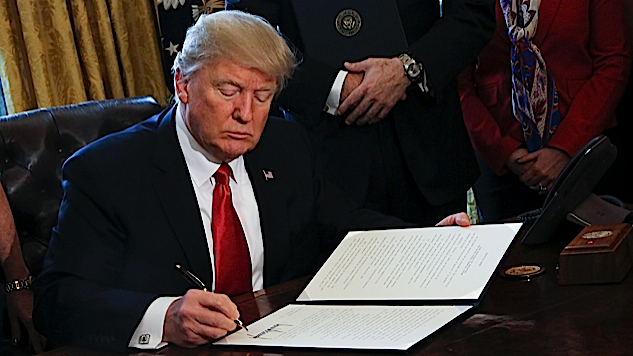 The Government has taken the position that the President’s decisions about immigration policy, particularly when motivated by national security concerns, are unreviewable, even if those actions potentially contravene constitutional rights and protections…..
Trump responded with his characteristic poise and grace. This isn't the first critique Trump has lodged against the judiciary, one of the three co-equal branches of government. On Feb. 5, the President called Seattle Judge James Robart a “so-called judge” in an enraged tweet after Robart struck down the ban. And Trump gave a stern warning to the Ninth Circuit ahead of its ruling on Wednesday during remarks at the Major Cities Chiefs Association and Major County Sheriffs' Association conference. It's really incredible to me that we have a court case that's going on so long. Now we're in an area that, let's just say, they are interpreting things differently than probably 100 percent of the people in this room. He's not wrong about that. Law enforcement is behaving as if the judiciary hasn't ruled on the issue. There have been multiple reported incidents of people of Middle Eastern and North African descent, whether from the seven countries in the order or not, being turned away at the US border in the past two weeks. Immediately after the initial stay on the order on Jan. 28 for those who had already arrived in the country, there were reports of immigration officials ignoring the court ruling. In the chaos of the weekend, agents tried to deport people within the scope of the court's stay. By Monday, however, the Department of Homeland Security announced it was in compliance with the court's rulings. Yet on Feb. 5, a Canadian citizen originally from Morocco was told she could not enter the country. After being fingerprinted, having her photo taken, and giving border patrol agents access to her phone, Fadwa Alaoui was told she would not be allowed into the US. The form she was given stated the reason was “subject is inadmissible to the United States.” Alaoui said border patrol told her it was because of prayers found on her phone. Social media accounts of similar incidents have circulated. Trump’s executive order was rejected on Jan. 30 by acting Attorney General Sally Yates. Yates ordered the Justice Department not to defend the law against challenges. Trump summarily fired her. 100 State Department diplomats have signed memos objecting to the ban. White House Press Secretary Sean Spicer suggested the diplomats resign if they disagreed with the administration’s direction. It’s all expected to come to a head in the next week or two when the Supreme Court hears arguments on the ban. At that point, the nation’s highest court will decide whether or not the order is constitutional—and in a more abstract sense whether or not the Trump administration will be constrained by the courts or not. It’s already apparent that Trump and his team have little regard for three branches of government. The rapid-fire signing of executive orders to determine policy in the first three weeks of the administration has shown that Trump has no interest in governing on equal footing with anyone else. And in this case, where the overreach is so blatant and disruptive and the executive’s reaction so petulant and destabilizing, there is a potential for a major collapse of governmental norms. Law enforcement, already emboldened by the election, have shown that they will obey Trump before they’ll heed the courts. What happens if, in the case of a Supreme Court defeat for the administration, border patrol and immigration agents refuse to obey the court order? What recourse is there if one branch of the government ignores another, simply because it dislikes the rules? That’s the reality we could be heading towards. And far from being an abstract question or a question of theory, the possibility of a breakdown in the societal norms that create the space for the American state to function is very, very real. Let’s make sure we don’t allow Trump to pick up the pieces.